There's no doubt about it: The it-accessory this season is the statement earring. From major chandeliers to edgy ear cuffs, we're seriously feeling over-the-top baubles in every measure. That's why we're sweet on NY-based designer, Assad Mounser. Mounser's blingtastic studs are an all-in-one ear party with a bold center stone, a few fun neon beads, and some daredevil spikes thrown in for good measure. 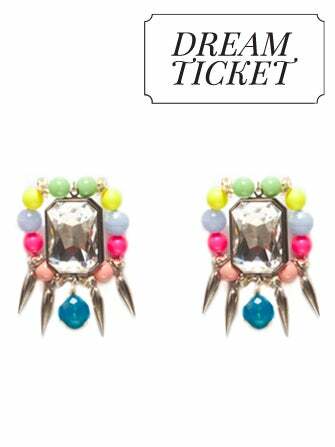 Basically, no matter what your aesthetic may be, these earrings are ready to turn you into a glamazon, instantly. Assad Mounser Chroma Crypt Earring, $195, available at Assad Mounser.